rv-pro.com March 2019 • RV PRO • 115 rv-pro.com March 2019 • RV PRO • 115 KING Falcon Directional Wi-Fi Extender Technology is king and the new KING Falcon Directional Wi-Fi Extender gives dealers a premium product that can help their customers gain access to a better online and streaming experience. Though a tech savvy product, it does not take someone who is tech savvy to operate. "We wanted to make it as easy as possible for the end-user, when designing the product," says Shawn Winn, sales manager for Bloomington, Minn.-based supplier KING. The KING Wi-Fi App walks the user through the initial set-up of the router and pairing with the KING Falcon. "This set-up only has to happen during the initial use, just like at home," says Winn. "Using the App the next time, the Falcon will scan for all available hotspots and ranks them in order of strength. You choose one of those and simply connect." The need for this product came from a desire to provide the end-user with an easier way of connecting. At campgrounds, a number of things can affect Wi-Fi signal strength and the closest physical hotspot may not have the strongest signal. The KING Wi-Fi App allows the user to choose a hotspot. The Falcon then aims itself at the selected hotspot and fine-tunes for maximum signal. 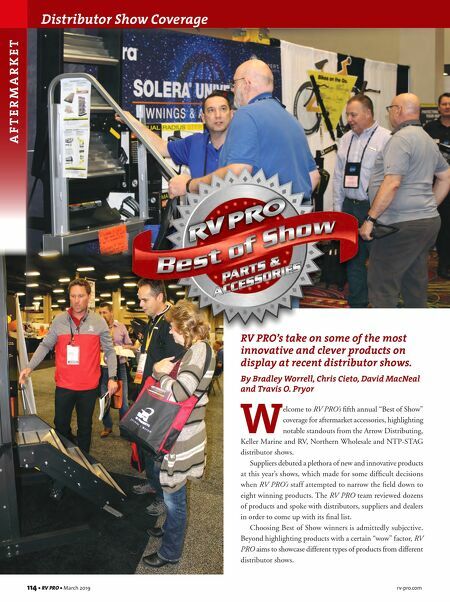 The product made its debut at the Aim Wholesale and Land N' Sea fall distributor shows, but it gained momentum as it won the 2019 New Product of the Year for the Northern Wholesale show, an award decided upon by dealer voting. "It's been really well-received. We did three dealer seminars at the Northern, Arrow and NTP-STAG show and it really drove traffic to our booth. A high percentage of people stopping by sat Dan Colaes, eastern regional sales manager for KING, shows off the Falcon WiFi Extender at the Keller Marine & RV Show. The Wi-Fi extender has a more powerful antenna because it finds the strongest signal available by being uniquely directional as opposed to omni-directional, according to the company. in on those educational seminars and chose to bring the KING Falcon and our Wi-Fi endcap to their dealership," Winn says. One of the items that Winn covers during those seminars is MAP pricing. The product has an MSRP of $449 with a MAP price of $399. "We have been using MAP pricing for quite a while on select products. It can be a struggle to police the Internet, but two years ago we partnered with a company to help with that. If someone violates the MAP pricing, they get a notification from us. The third time it happens that dealer can no longer sell our products. By eliminating one dealer violating MAP, we help a thousand others." When asked to explain what makes this product different that other Wi-Fi extension products. Winn points to antenna strength. "The Falcon is unique in that it uses a directional antenna rather than an omnidirectional antenna used by other systems. Because it's communicating directly with the hotspot, we're able focus its high-gain performance and ignore noise from other sources that can slow down omnidirectional products. 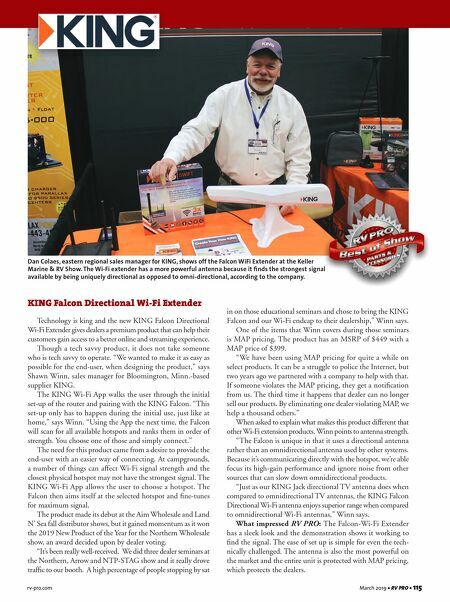 "Just as our KING Jack directional TV antenna does when compared to omnidirectional TV antennas, the KING Falcon Directional Wi-Fi antenna enjoys superior range when compared to omnidirectional Wi-Fi antennas," Winn says. What impressed RV PRO: The Falcon-Wi-Fi Extender has a sleek look and the demonstration shows it working to find the signal. The ease of set up is simple for even the tech- nically challenged. The antenna is also the most powerful on the market and the entire unit is protected with MAP pricing, which protects the dealers.